We write unbeatable Federal resumes and KSAs for all sectors & levels of experience. For each KSA, the government will want to know how your own knowledge, skills & abilities support the specific job requirement that is being addressed. Together, we'll transform your response into a factual-based statement designed to convince them that you were meant for the job to which you are applying! resume and/or KSA writing process! 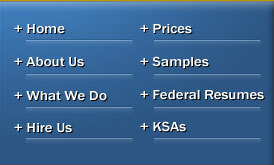 Over the years, virtually ALL of our clients have reported SUCCESS with our Federal resumes and KSA responses. Consequently, we are confident enough in the skills of our contracted professional resume writers to offer FREE reviews, critiques, and editing samples of YOUR own Federal resume or KSA responses. E-mail us a copy of what you've written thus far and we'll reply within 1 business day or less! Many of our clients wait until the last minute! If you already have an interview date lined up, select our 3-4 day RUSH service to increase our speed without decreasing the quality of our output.